Every year since 2014, as part of the Public Breastfeeding Awareness Project, I document breastfeeding mothers in public locations. These are images that will be shared on social media during World Breastfeeding Week and throughout the month of August. 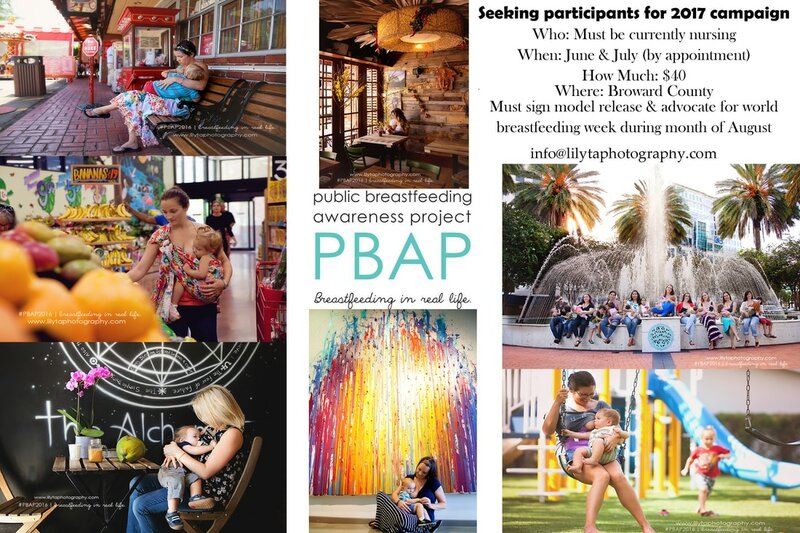 These images have reached across the world and are helping to normalize public breastfeeding. We work with local venues and the community to find breastfeeding friendly places and capture images of real life mothers and their nurslings. We are seeking advocates that feel comfortable nursing in front of the camera in public places. Must be comfortable being viral on multiple media platforms. This is a project created by Leilani Rogers and has gained a huge following over the years. Lilyta Photography is proud to partner up with peers across the country and abroad to share more beautiful photographs of one of the most naturally created ways of nurturing babies. Nursing children of all ages welcome. Photo sessions will take place in various locations in Broward County. A signed model release and $40 project contribution fee will be due when booking appointment and includes 2-3 images. A final group photo will take place end of July and open to everyone at no additional charge.